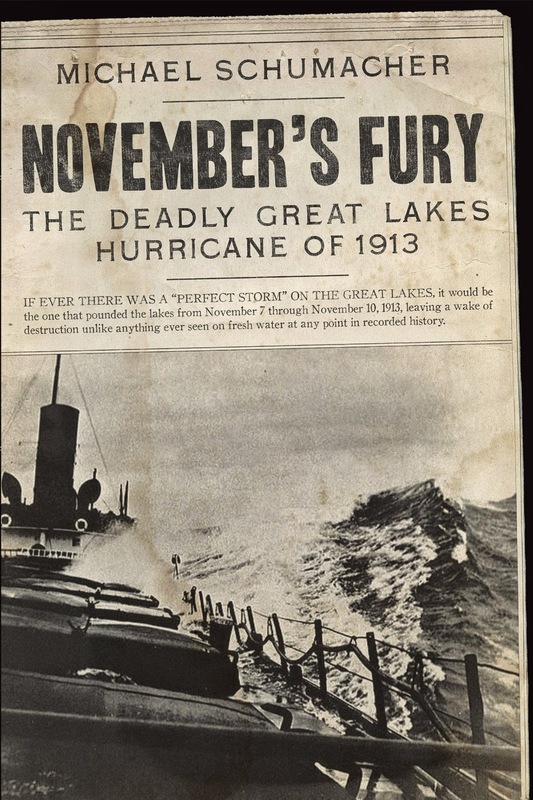 On June 4, Michael Schumacher spoke about his book, November’s Fury: The Deadly Great Lakes Hurricane of 1913 (Minneapolis: University of Minnesota Press, 2013). For four days in November 1913 two separate but equally massive storm cells swept across the Great Lakes. When the storms blew themselves out, over 250 sailors had died and dozens of ships had been sunk, stranded, or demolished. Michael Schumacher shared the story of this event not through statistics but rather by telling the stories of those who experienced this awful storm. As he said early in the presentation, there were far more stories than time to tell them, but in the time allowed, Mr. Schumacker shared a few of his favorite tales. One such story was that of Captain John Duddleson and his ship, the L.C. Waldo. Duddleson was an experienced sailor, having begun sailing in 1867. He was good at his craft, and assumed command of his first ship when only 27 years old. The Waldo was on Lake Superior and as the storm grew, Duddleson made the decision to run for the shelter of the Keweenaw Peninsula, about 45 miles southwest of his then current location. But nature was not kind to the captain and his crew. Shortly after changing course, a gigantic wave crashed over the ship. The front of the pilothouse, the compass, the steering wheel, and the wheelsman were swept to the deck. Electricity to the front of the boat was severed. Duddleson and his first mate only managed to stay near the remains of the wheelhouse by diving into a hatchway leading to the captain’s bedroom. With the pilothouse wheel now useless the ship pitched and rolled violently. Working in the dark, Duddelson retrieved a compass from a lifeboat by which to steer. He, his first mate, and the injured but still reasonably able wheelsman managed to light an oil lamp and piece together a way to steer the ship using the auxiliary wheel. For two hours this patchwork held, and Duddleson began to have hope that the ship might be able reach the Keweenaw and drop anchor. The ship was a goner, but amidst the wreck, Duddleson struggled to save the crew. As the ship hit the rocks, the stern sagged and the boat began to split across the middle. Duddleson realized that the worst danger at the moment was that the ship might slip back off the rocks, and sink in deep water. Thus he ordered the vessel flooded, and all hands to the forward part of the boat. The men, and two passengers, moved forward, grabbing as they did the only provisions the crew would have for days -- two cans of peaches and one of tomatoes. Taking shelter in the forward windlass room, Duddleson realized that without heat they would all soon freeze to death. Duddleson ordered the bathtub ripped from his quarters and brought to the room. While this was accomplished others gathered fire buckets out of which they cut the bottoms, and anything that would burn. Using these rudimentary parts, the bathtub served as a fireplace, vented by a makeshift chimney cobbled together from fire buckets. As the storm raged, Duddelson and his crew got a small piece of luck -- the George Stephenson, also running for shelter, came upon the wreck. In a daring decision, the captain of the Stephenson ordered his ship in close, dangerously near the rocks, to see if there were survivors. With a split deck, no visible light or smoke, and being covered in ice, things appeared hopeless, but as the crew of the Stephenson looked on, a distress flag rose from the Waldo’s deck. Unable to maneuver close enough to accomplish a rescue, the Stephenson raised a flag indicating that they had seen the Waldo’s distress signal and they stood by to offer moral encouragement, while the first mate of the Stephenson was put over the side in a small lifeboat and sent to the U.S. Lifesaving Service Station at Eagle Harbor to find help. As the storm raged, the mate eventually reached shore. But he landed at a village with no phone. With tremendous effort he first hired a boat to take him across a small lake, then a sleigh to carry him to Eagle Harbor. Once there, he discovered that the large lifesaving boat needed to accomplish the rescue was in need of repair. Work began instantly, but time passed. Aboard the Stephenson, an increasingly impatient captain ordered his second mate ashore, this time to try to contact the lifesaving station at Portage Lake, near Hancock. After two days, at 3:00 in the morning, the crews from both lifesaving stations arrived almost simultaneously in their boats at the wreck of the Waldo. Rescue was now possible, but still dangerous. The boats of the lifesaving service were built to come close to a ship stranded on rocks, but the still crashing waves made it impossible to tie the rescue vessel to the wreck. A rope ladder could be lowered down the side of the Waldo, but each member of the Waldo crew would have to climb down that ladder in the still strong storm and jump to the deck of the bobbing rescue ship. Timing was everything because the goal was to jump when the waves raised the rescue ship as close to the end of the ladder as possible. It was a dangerous operation but, miraculously, the entire crew of the Waldo, including the passengers, survived to tell the tale. Schumacker complimented the story of the Waldo with that of Milton Smith. Smith had an uneasy feeling about his boat that November. As first assistant engineer, he had a good job aboard the Charles S. Price. But as the last two runs of the season approached, he walked into the captain’s office and signed off the boat. The captain, as well as the chief engineer, tried to talk him out of it, but Smith had made up his mind. As Smith left the boat, he spoke with a friend and fellow crewman, Arze McIntosh. McIntosh had the same bad feeling about the trips, but he wanted the extra pay the trips would bring him, plus a sizable bonus he would receive for closing the season with the vessel. “Damn it,” McIntosh said as Smith walked ashore, “I wish I were going with you.” It was the last words the two men ever shared. The Price would sink a few days later, taking McIntosh and the rest of the crew down into the sea. Michael Schumacher shared a night of memorable storytelling about the Great Storm of November 1913. The images of the newspaper headlines were found in the Calumet News of November 11, 1913, which were digitized by the Clarke and made available on the Library of Congress's Chronicling America website through the National Digital Newspaper Program.